Sellier & Bellot has been doing business since 1825. Even though the 8x57mmJR came out in 1888, making the round basically an ancient relic in the eyes of most, it is still a longstanding member of the product portfolio of Sellier & Bellot. 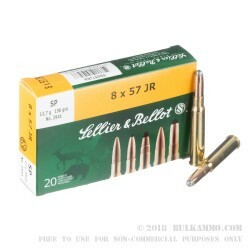 This Mauser variant is a popular European cartridge that had at one point become quite popular in the USA, but has again dropped down a bit in favor in the United States. That doesn’t diminish the power and ballistics of this potent round which was used in Europe over the past 100+ years as a sporting round that could reach the upper echelons of performance and stopping power. 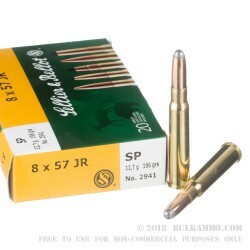 It has been used to kill everything including dangerous game and continues to be produced as a rifle round for sporting purposes because great ballistics never really die. 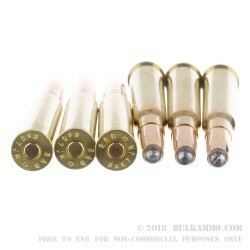 This is a soft point projectile of 196 grains and it is loaded into a premium brass cartridge casing that has a Boxer primer and the load represents a very good price point for the premium components and given that this ammunition is hard to find nowadays. This is a 20 round box of ammunition. Q: This looks like it would be pretty slow ammo, am I wrong?